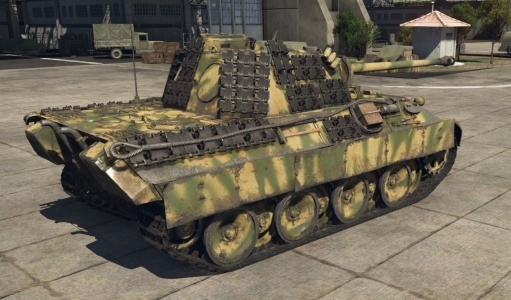 Add-on Armor is a modification in-game that allows the player to enable the addition of improvised armor onto their tanks. Tank warfare is a type of battle that can make the equipment involved become obsolete very quickly in terms of protection and firepower. In World War II, this is seen especially in the later half of the war when the Shermans and T-34s began being outgunned by better German tanks, and the German Panzer IV also being outgunned by those tanks. In an effort to get more protection onto their tanks, crew often improvise a variety of methods to increased the armor on their tanks. Methods included welding tracks or sheet metals as appliqué armor onto the tanks, placing sand bags on the hull, hanging logs from the sides, placing mesh sheets, or simply just pour concrete on the hull for the thickness. While these protection vary in their ability to stop a penetrating round or warhead, they all increase the overall weight of the tank, often taxing the suspension and steering beyond their normal capabilities. 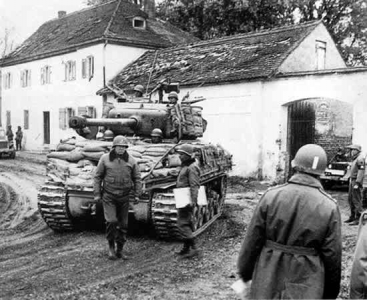 General George S. Patton, commander of the U.S. Third Army during the invasion of France, heard of this effect of improvised armor on the tank's suspension and forbid his units from using the common sandbags as improvised armor to mitigate vehicle breakdowns (he was however a fan of welded metal sheets similar to the M4A3E2 Jumbo and had many normal Shermans made into make-shift Jumbos). Results vary from the variety of improvised armor used in the war. Some armor, like the concrete, was deemed useless or impractical and were not widely used. Sandbags and logs were mostly seen as ineffective against the tank rounds and HEAT warheads used by infantry anti-tank launchers. Out of the bunch, welded metal was perhaps the most effective improvised armor one can put onto a tank. A study done by the U.S. Army on the improvised armor used by the tankers on their Shermans reveal that while the majority of improvised armor had little effect on armor protection, the best impact of improvised armor was morale, as they at least gave the worried tankers an additional bit of psychological, if not physical, protection for their tanks. In the game, the Add-on Armor modification adds spare track links along the hull and turret of the tank being modified. The track links, when added, give an around 17 - 20 mm of additional armor to where they are attached. As the vehicle ranks increased, the type of armor added increased in complexity from simply "improvised" type additions such as tracks to integral upgrades such as explosive reactive armor. 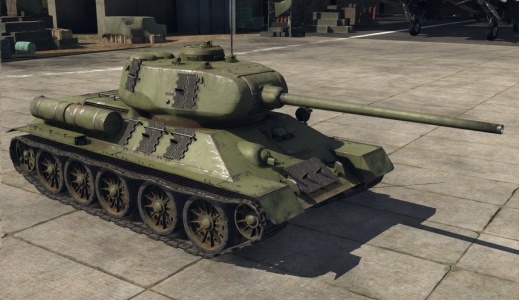 As of 1.67, the add-on armour now adds mass to the overall vehicle weight, meaning a lower power-to-weight ratio and thus lower mobility. The M4A1 (76) W Sherman with add-on armor on side of the hull and turret. The Panzer IV Ausf. H with add-on armor on the front of the hull and turret. 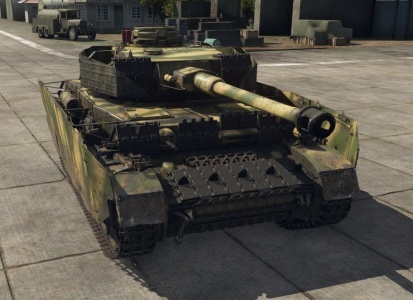 The Panther D with add-on armor on the sides of the turret. 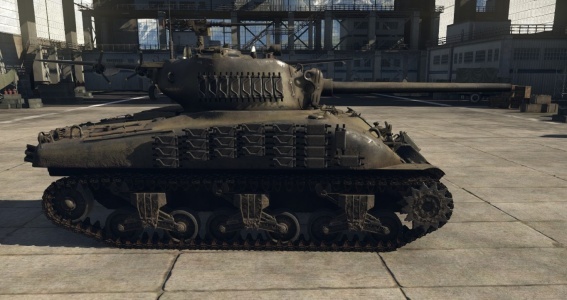 The T-34-85 with add-on armor on the sides of the turret and hull. 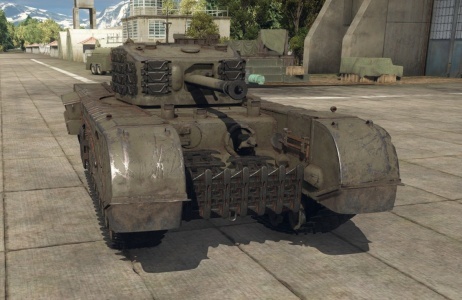 A Churchill Mk VII with add-on armor on front hull, front turret, and turret sides. A M4A3E8 Sherman sporting sand bag add-on armor. Trivia: The man in front is George Patton, who just finished chewing out the crew for using sand bags, which he banned on tanks. 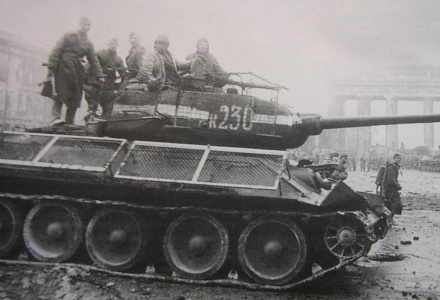 A T-34-85 with added mesh screens as protection against HEAT rounds. This page was last edited on 17 January 2019, at 07:17.